Much like potato chips and Chinese food, you just can’t have too many pairs of headphones. What you wear in front of your PC versus lounging around the house or working out should differ as much as your given needs. At least, that’s LG’s theory with their sterling line of Bluetooth headphones. In this case, we spent profuse amounts of time listening to two additions to LG’s line that are for decidedly different purposes. The LG Tone Studio are mobile device-centric, but aimed at a more sedate life. These headphones are a strange marriage of earbuds and portable speakers. They sit around your neck and with the flip of a switch can move from private earbud-based sound to personal open air surround sound speakers. It’s an odd pairing. The idea, near as I can tell, is a higher quality audio alternative to the middling speakers most phones and tablets offer. The exterior sound uses four speakers to create a DTS-certified surround sound field around your head. On that front, these personal speakers do a solid job, with surprisingly immersive sound. The Tone Studios are actually light enough to wear while moving around and doing, say, light housework, cooking, or just aimlessly walking through the house. I actually liked having an option for a personal sound system for music without having to stick things in my ears. The Studio has a noticeable disparity in sound quality between the external speakers and the earbuds though. More specifically, the earbuds sound fantastic with great range and crisp, clear sound. The around-the-neck speakers are certainly better than most phone or tablet speakers I’ve encountered, but just don’t have the same full body sound as the buds, even if the inclusion of surround sound is a nice perk for movie watching. The Tone Studio headphones excel in the battery life department. Over 30 hours of listening with the earbuds and about six hours in speaker mode. Bluetooth setup is easy and you can even link two together for, one presumes, romantic cuddle watching around the tablet (I guess?). For a list price of $229, however, these aren’t exactly an impulse buy. Where the Tone Studio is for more casual activity, the LG Force lets you know right from the get go they’re built for action. These are not Bluetooth headphones for the lazy people. Sweat and water resistant and an around-the-ear design that holds them in place for running, jumping, squatting, and those occasional sudden street fighting bouts, the Force are all about moving with you. As it happens, they do a good job of being a proper workout buddy. Once you install them around (and in) your ear properly, they really do stay in place during heavy movement. There’s a small controller for volume and play/pause around the strap that holds the two ear pieces together, although the strap is short enough that you’ll likely have to control it by feel instead of looking down at it. If you get a call (as if anyone makes calls anymore), the Force lets you take the call without having to stop your marathon. For a list price of $99, the Force has a lot of great features for your workout needs, but the audio sounded slightly shrill at times—especially in comparison to LG’s Tone earbuds. They certainly aren’t the worst sounding headphones I’ve tried at this price point, but could definitely do with a bit more punch and range. On the plus side, six hours of playtime is surprisingly excellent, especially in comparison to competing similar buds like the Samsung Gear IconX (which caps out at under two hours). 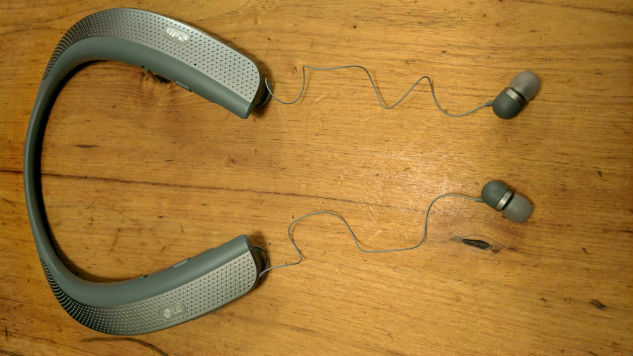 LG has a long line of headphones out there, but these are two of the most specific and unusual. If you’re looking for wearable speakers with great earbuds, however, the Tone Studio is probably the only game in town. As far as workout-specific headphones go, the Force are solid, easy to use, and not absurdly expensive.